In the entertainment world it’s pretty clear: your ears either love rockabilly music or they can’t stand it. This is the way it has always been in the ’50s, ’60s, ’70s, ’80s, ’90s, ’00s, and it hasn’t changed at all right up to this very day. You’re either a fanatic who’s ears perk up when you hear the strains, or you’re a dilettante who’s nose turns up in disgust whenever a song with twangy guitars being played at a 120 mph breakneck speed crosses your path. There is no middle ground. So fasten your seat belts and take a ride with these hillbilly heroes who really rock out. This terrific trio with Roy Sludge on vocals and acoustic guitar, Jimmy Scoppa on electric guitar and Johnny Sciascia on upright bass just may be the best band around. Noise: Is your group’s rockabilly more country or more rock ’n’ roll? 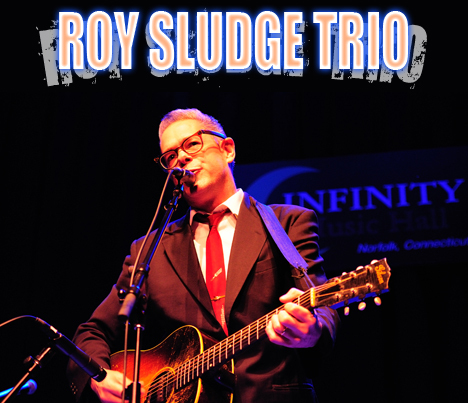 Roy Sludge: I’d say a little bit country and a little bit rock ’n’ roll as Donny and Marie used to say. Jimmy Scoppa: In my opinion it feels more country but it definitely rocks out too. It swings. Johnny Sciascia: More country, in my opinion. We’re a honky-tonk band that delves into rockabilly and rock ’n’ roll. Noise: What’s the difference in the trio now that Jimmy has taken over for Duke Levine on guitar? How are the guitarists different? Roy: Duke is obviously a force of nature, but Jim is every bit as good, just in a different way. He’s an incredible “sweet spot” player. Johnny: The difference is hard for me to define. To my ears, they both play this great Tele (Telecaster) style, like James Burton; but there is a difference. Maybe a better question for a guitarist? Noise: With a famous jazz school, the punk history of our town and so many young people going to colleges in the area, does it surprise you that so many fans pack the clubs for all your gigs? Why do you think this is? Roy: It always pleasantly surprises me when a club is packed. Our fan base is mostly in the 50-ish age group. Folks who like the afternoon show and like to dance, but there are youngsters out there too. Jimmy: I think people just like good music. It’s not about rocket science. Johnny: Hanging around the same town for a long time helps. We’ve all been playing around Boston for years. I’d like to think consistently providing good and unique music with a good band keeps folks coming. Noise: What’s the attraction of rockabilly music in 2017? Roy: Hard to say. Maybe it’s just different than new or alt country, and again, it’s easy to dance to. Jimmy: The attraction for rockabilly music has never gone away and hopefully it won’t. Johnny: There’s always a cult following for rockabilly, because it involves fashions and styles with it’s followers. But, I believe it can be more inclusive to a larger audience, like Johnny Cash, who’s an obvious influence on Sludge. Noise: Any other New England rockabilly bands you really dig? How are they different from you guys? Roy: I don’t really get out that much, but I like Jittery Jack, and The Barley Hoppers. Jack is more straight up rockabilly with drums, where I think we lean more on country and we have no drummer. The Barley Hoppers are actually very similar to what we do and we are all friends. Jimmy: Memphis Rockabilly were my favorite but I’m not sure how much they are playing these days. Johnny: As a bass player who gets hired by some of these bands on occasion, I am probably bias, but I really like working with Rhode Island bands The Barley Hoppers (which is similar to Roy Sludge in approach and content) and The Bop Thrills (more of a Gene Vincent influenced group with drums). There’s Boston’s, Jittery Jack (straight ahead rockabilly with drums). There’s a band from Rhode Island that I like called The Red Pennies (honky-tonk band with drums). Noise: Give me a brief history of rockabilly music and it’s ties to New England. Roy: That’s a tough one. I’m not really one of those music historian guys, but off the top of my flat head I would say it started with Gene Maltais and his song “Gang War.” Also, one of my heroes, the great Sleepy LaBeef lived around here for a while. Other early bands include The Memphis Rockabilly band formed around 1978, who I have played with off and on for twenty seven years. Also The Crank-Tones, The Raging Teens and countless others I’m forgetting. Jimmy: Well country music has always been around especially in New Hampshire which has a very Southern feel to it, and rockabilly is similar to country music in a lot of ways. I saw this growing up when I was younger and spent a lot of time with family up there. Today, The Raging Teens with Amy Griffin are really good ! Johnny: To my recollection, when I first came on the scene in the mid-to-late ’80’s, there was Memphis Rockabilly in Boston, and Jack Smith & The Rockabilly Planet in Rhode Island. I was involved in the next generation of rockabilly bands that included The Boogeymen and The Crank-Tones and The Spurs. The next generation after that was bands like The Racketeers and The Raging Teens. I don’t follow the scene as I once did, but the newer bands I see coming up now seem to be from Rhode Island like The Red Pennies, The Barley Hoppers, and The Bop Thrills. Noise: Link Wray. Scotty Moore. Billy Lee Riley. Carl Perkins. List in their order of importance and explain why. Roy: Again, another tough one, but in order of appearance: Scotty Moore defined the Merle Travis style and turned it into rockabilly. Carl Perkins was definitely a rockabilly innovator and hugely popular, whereas Billy Lee was much less known but great none the less. I’ve always loved Link Wray, but I consider him more rock and roll although he did do some great rockabilly. Jimmy: Scotty Moore for me was the first person I saw on film who changed my world. Carl Perkins, one of the most influential song writers and guitar players, Link Wray, the first guy to intentionally distort his sound was a very important man. Billy Lee Riley was another great but lesser known rockabilly artist. Johnny: 1. Carl Perkins – The name on the list that a lot of the mainstream music fans would most likely recognize, because of “Blue Suede Shoes” and the Beatles’ covers. Big influence on The Beatles, and George Harrison in particular. 2. Link Wray – Also had a hit that showed up years later in Pulp Fiction with another one of his instros, keeping him relevant to another generation. Tough sounding instrumentals that’s more twang than surf. 3. Scotty Moore – Every rockabilly guitarist and early-Elvis fan knows who he is. 4. Billy Lee Riley – I played bass for him once at the Lone Star in NYC! “Red Hot” and “Flying Saucers Rock And Roll” may not have been big hits, but they’re great, and are standards of every rockabilly band’s repertoire. Noise: Name some good rockabilly bassists and drummers and tell us what makes them good at their instruments in this genre? Roy: For bass, of course our own Johnny Sciascia, Jack Hanlon, Rory Macleod, Matt Murphy and many more I’ve forgotten. Good roots drummers are extremely hard to find, but local boy Judd Williams is one of the best. Also Stan Kozlowski from Rhode Island is also great. What makes them good is they’re tight and they LISTEN and keep their heads up as to what’s going on onstage. Jimmy: Bill Black with DJ Fontana. The Stray Cats. Bass players who can slap the hell out of it and drummers who swing. Johnny: I learned to play bass watching Bill Black on a video tape called Elvis ’56. Marshall Lyttle played bass for Bill Haley. Listen to “Rock Around The Clock” loud to hear what a slapped upright bass should sound like on record. Jerry Allison’s drums on Buddy Holly’s “That’ll Be The Day” and “Think It Over” is what a rockabilly shuffle should sound like. Noise: Who’s the better band, you or The Stray Cats? Jimmy: I‘m a big fan of Brian Setzer and I’ll leave it at that. Johnny: The Stray Cats are richer, so they must be better. I saw them in the ’80s, and it was a great, memorable show! Noise: Can you give me the best title of a rockabilly song you’ve ever heard? Can you give me the name of the coolest composition that you’ve ever written? I’ve never written a song. Noise: Why are you set up as a trio without a drummer? Does this expand or limit your ability to communicate your music? Roy: 1. Simplicity. 2. Volume. 3. It was Elvis’s original line up of upright bass, acoustic guitar and electric guitar. 4. You don’t have to pay a drummer. 5. I don’t feel limited in any way without a drummer. Johnny: There is a tradition of early, drummerless rockabilly and honky-tonk acts. Elvis had just Scotty and Bill on his first recordings. Johnny Cash had the Tennessee Two. Johnny Burnette did some trio recordings. It keeps the set up simple and stream-lined. And, one less guy to pay! Roy: …they are incredibly drunk. Jimmy: …they want to party. Johnny: …their life isn’t so bad.